Periodically, League of Education Voters hears about plans for strikes across the state. As a result, we have researched answers to some of the frequently asked questions we have been hearing. We will continue to update this page as we receive more questions. Have a question we haven’t answered? Please submit it to League of Education Voters Communications Director Arik Korman. A strike is an organized refusal to work by employees as a means of protest. It is a tactic that may be used during contract negotiations if employers and employees cannot agree on terms of employment. Why are people talking about strikes? Why do teachers strike? In some school districts, the teachers union and the school district administration are having a difficult time coming to agreement on a new contract. There are a number of issues that may be difficult to come to agreement on, such as working conditions, teacher pay, curriculum, and other staff supports. What are negotiations and how do they work? Collective bargaining agreements, otherwise known as contracts or CBAs, are typically agreed upon for 2- or 3-year terms. When the contract term is ending, a team representing the school district and a team representing the teachers union meet to determine the terms and conditions for the next contract. In some districts, the union that represents teachers may also represent other staff, so terms of employment may be negotiated for multiple types of school employees. If necessary or if negotiations have stalled, a mediator may be called in. The mediator’s role is to facilitate the discussion and help come to an agreement. The mediator is neutral and ensures that both parties are communicating clearly, while keeping in mind the mutual goal of arriving at a reasonable solution. The state recently changed the way it allocates funding for teacher salary to districts. It now provides a base average salary per teacher, adjusted by a regionalization factor and, in some districts, an experience factor. In 2018-19, districts will receive between $65,216 – $80,868 per teacher in state funded salary for every teacher they are allocated in the state funding formula. The amount of teacher salary funding each district will receive is determined by a district’s regionalization factor. A district is put in one of several regionalization factor tiers based on the “single-family residential value” of properties in that district. Districts with higher property values will be placed in higher regionalization factor tiers which will generate higher levels of state funding to hire teachers. Additionally, starting in 2019-20, 56 of the 295 school districts will receive an experience factor, a 4% salary increase, based on the characteristics of their teacher workforce. Experience factor is awarded to districts whose teachers had more teaching experience and higher levels of educational attainment during the 2017-18 school year than the state average. Eligible districts will receive the salary increase from 2019-20 through 2022-23. While the state allocates money to districts for salary based on the above factors, local school districts then negotiate with their teachers’ unions to determine which factors or teacher characteristics will determine the amount of each teacher’s actual salary. Historically, almost all districts pave paid more than the minimum on the salary schedule using local funds from levies and state dollars allocated for other purposes, such as materials, supplies, and operating costs (MSOC). For example, in Pasco for the 2017–18 school year, the average state base salary was $52,525, while the average total salary was $66,586 including local and federal dollars. How much money can districts raise through local education levies? Beginning in January 2019 school districts will be able to raise less local levy funding due to legislative changes enacted in House Bill 2242 (the so-called McCleary Fix). The state will cap local levy revenues at $2,500 per-student for districts with high property wealth; districts with less property wealth will have their combined local levy revenues and Local Effort Assistance (LEA) capped at $1,500 per student. In all, two-thirds of Washington school districts will be capped at this $1,500 per-student level. The year the Legislature enacted HB 2242, Washington school districts raised more than $2,200 per student on average in local levies, for a total of over $2.4 billion in annual levy revenues. OSPI projects the levy changes will reduce statewide local levy collections by over $1 billion annually beginning in 2019. Historically school districts used over half of local levy funding, $1.2 billion annually, to enhance base teacher salary. What did the Supreme Court say about teacher salary in the McCleary decision? In its McCleary decision, the Washington State Supreme Court found that the state salary was not adequate to recruit or retain teachers. In other words, the state was not fully funding salaries for basic education and relied on local districts to make up the difference. The Court found in 2018 that the legislature’s new plan to fund teacher salaries was sufficient to recruit and retain teachers. A CBA is a collective bargaining agreement, or contract. This contract includes the duties, salaries, and other terms of employment agreed upon by the school district and teachers union (or other employee union). How do I find the current teacher’s contract in my school district? Collective bargaining agreements (CBAs) are public documents and are typically available on your school district website. They can often be found on the employee, staff, or human resources pages. If the website has a search function, try searching for “collective bargaining agreement” or “CBA” to find a link to the current contracts. If the CBA is not available on your district’s website, or if your district does not have a website, you may call or email your district communications office and request a copy. Can schools stay open using substitute teachers and administration? Technically, yes. Schools could attempt to stay open using substitute teachers or other alternative means of staffing. However, from a practical standpoint, this is unlikely to happen due to the sheer number of substitute staff that would be required. I have to work. What will I do with my kids if there is a strike? During a strike, there are no requirements that alternatives be provided to parents for childcare or educational activities. A district may choose to partner with community-based organizations and other agencies, such as a parks department, to connect you and your students with alternatives. To learn about any alternatives for your child during a strike, contact your school district’s communications director to ask about what options might be available in your community. 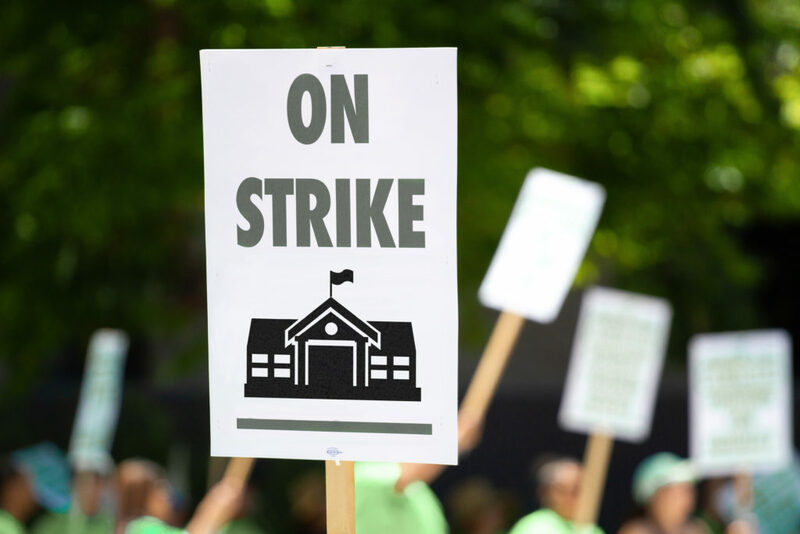 Are teacher strikes mentioned in Washington state law? Yes. RCW 41.80.060 states that the right to strike is not granted to any public employees, which includes teachers. A 2006 Attorney General opinion also asserts that there is no legally protected right to strike, though no penalties for striking are established in law. Many local collective bargaining agreements also include a “no-strike” clause. Is there any way for the community to stop a strike? There is a process called an injunction to stop a strike. An injunction is a court order forbidding something from being done or commanding something to be done. During the 2003 Marysville teacher strike, a parent group and the district both sought injunctions from the court, which mandated that teachers return to work. What is the Washington State PTA’s position on teacher strikes? Do teachers get paid for the time that they strike? Teacher contracts are for at least 180 days. The district is also required by the state to provide 180 days of instruction for students. So, if teachers go on strike, the days that are missed will be made up at some point before the next school year. Thus, a strike will not impact a teacher’s income over the school year or a teacher’s number of working days. The state has a requirement for 180 days of instruction. Does the school district still have to provide 180 days of instruction if there is a strike? If so, how does the district make up the days? Yes, school districts must provide 180 days of instruction regardless of a teacher strike, inclement weather, or another event that causes the normal school calendar to change. Districts will reschedule the school days to make them up at other times during the school year, likely by decreasing school breaks and/or shortening summer vacation. How have available education funding resources changes for districts? The changes made in the 2018 legislative session will fully fund the salary increases in 2018-19, but the changes to the local levy system won’t take effect until the middle of the 2018-19 school year. Districts won’t feel the impact of the levy changes for a full school year until 2019-20. This means that districts will have fewer combined state and local resources available in 2019-20 than 2018-19. 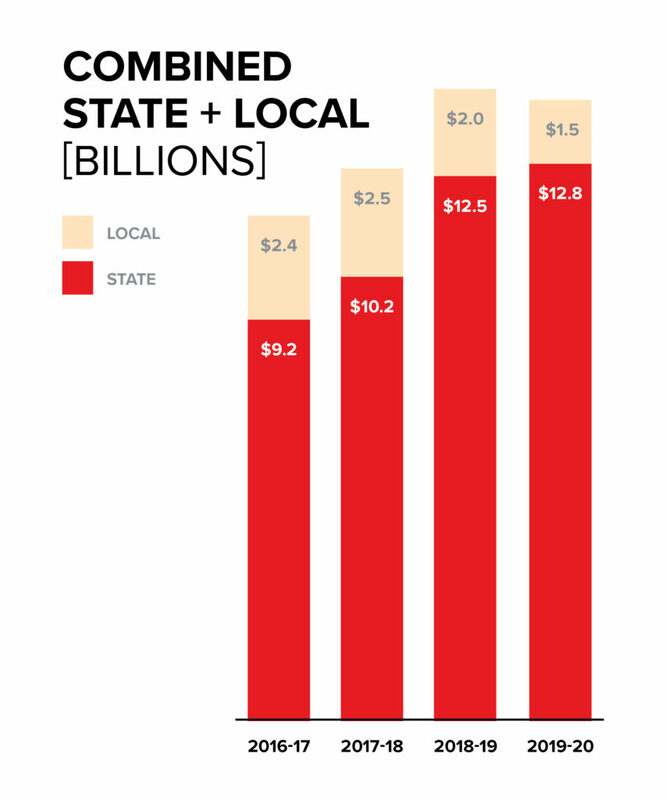 However, the combined state and local resources available in 2019-20 will be over $1.5 billion more per-year than 2017-18. If teachers are striking for more money, where will the school district find the money? School districts may use a variety of strategies to meet the demand for higher salaries, including using state funds for materials, supplies, and operating costs (MSOC), cutting programs that fall outside the definition of basic education, and dipping into district rainy day funds or reserves. What is the average teacher’s salary? In the 2017–2018 school year, the average state base salary was $56,022. The average total salary was $71,683, including local additional funding. The total salary includes teachers who take on additional responsibilities such as teaching summer school or coaching a sport. The new state-funded statewide averages will be $71,711 for 2018-19 and $73,283 for 2019-20, not including additional salary for teachers taking on additional roles. Where can I find information that shows all teacher pay, including state and local pay? The Office of the Superintendent of Public Instruction’s (OSPI’s) personnel summary reports provide average state base and average additional salaries for the 2017–2018 school year. These salary totals reflect the previous way in which the state funded teacher salary. What are school district budget reserves and what are they for? District budget reserves are unspent money districts set aside in the event of an unexpected cost to the district or a revenue shortfall. Budget reserves aim to limit the educational disruption to students when a district’s expected costs exceed their available resources that may happen during recessions, failed local levies, or other financial events. What is MSOC? Can MSOC money be used to pay teacher salaries? MSOC is state funding provided for materials, supplies, and operating costs. In most cases, the funding categories in the funding formula are for allocation purposes only. This means that dollars allocated for materials, supplies, and operating costs (MSOC) could be spent on teacher salaries if the school district decides to do so. Can other state funding be used to pay teacher salaries? The funding formula the state uses to distribute money to the districts is for allocation purposes only. For most funding categories, the district determines locally how to spend the money from the state, though there are some restricted categories of funding. This means that dollars allocated for things like materials, supplies, and operating costs (MSOC) or for support staff like counselors and librarians can be used for teacher salaries if the district decides to do so. Do school board members get paid? By law, each member of the board of directors of a school district may receive compensation of up to $50 per day for attending board meetings and or performing other services on behalf of the school district. They cannot be paid more than $4,800 per year (RCW 28A.343.400). What counts as an instructional hour and day? The state sets minimum instructional hours and days that must be provided to students in a year. School districts must offer 180 days and an average of 1,027 hours of instruction a year. The definition of an instructional hour includes time spent engaged in educational activity, recess, passing time between classes, and parent-teacher conferences (RCW 28A.150.205). An instructional day is not defined in state law. The length of a school day is something that may be negotiated in a collective bargaining agreement between the district and the teachers union. Who is in the room during contract negotiations? The participants in the collective bargaining process may vary across districts. For example, in one large, urban district, the team for the district includes building principals and senior district-level staff, but not school board members. The team for the teachers union consists of local union members, but no representatives from the Washington Education Association. Community members and other stakeholder groups are not involved, nor allowed to observe the negotiations. In another small, rural district, the team for the district included the superintendent, business manager, and building principals. The team for the union included the president, vice president, secretary, and treasurer as well as the UniServ representative at one meeting. Again, members of the community and other stakeholders were not present. Have a question we haven’t answered? Please submit it to info@educationvoters.org.